The UKC Terrier Race Program was a formal racing program open to many Terrier breeds, as well as Dachshunds. 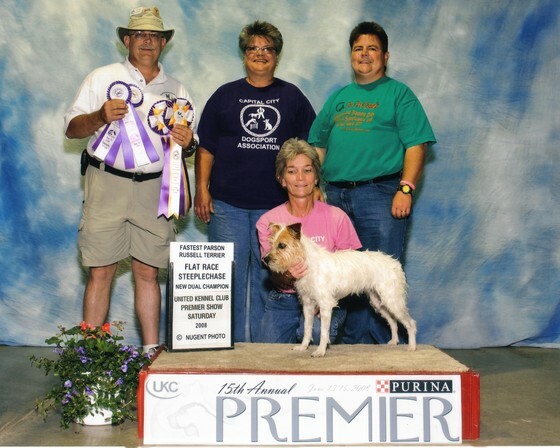 It was a fast and fun sport available to terrier owners that may not wish to participate in conformation or obedience venues, but still want the excitement and thrill competition brings to both dog and owner. The participating dogs ran a flat straight track or a straight track with small jumps following a moving “lure” pulled on a string. It was amazing to watch the drive and desire these dogs displayed when trying to “catch” that lure! The inherited prey drive all terriers possess was highlighted in a fun way, and these events were truly a great family sport for all to enjoy. The Terrier Race Program was offered from 2004 through 2014, but was then eliminated as of January 1, 2015 when the United Kennel Club replaced it with an expanded racing sport called "Drag Racing". Drag Racing is an expanded racing event open to all UKC registered pure bred dogs or dogs possessing a PL-Performance Listing Number (for mixed bred dogs, purebred dogs of unknown pedigree, purebred dogs with disqualifying faults or breeds not recognized by the UKC) providing they measure 18" tall or less at the withers. Racing Aptitude titles are offered in flat and steeplechase, and racing titles are also offered in flat and steeplechase categories divided by size. 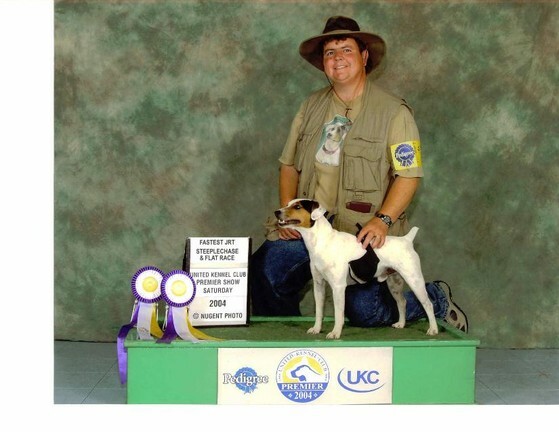 Capital City Dog Sport Association enjoyed offering UKC Terrier Races from 2009 through 2014. Our Board of Directors reviewed the rules for the new Drag Racing sport and made the decision to discontinue hosting UKC Racing events. Several of our CCDSA members continue to enjoy the UKC Racing program individually and compete in Drag Racing with their terriers. Capital City Dog Sport Association 2011 Terrier Races. 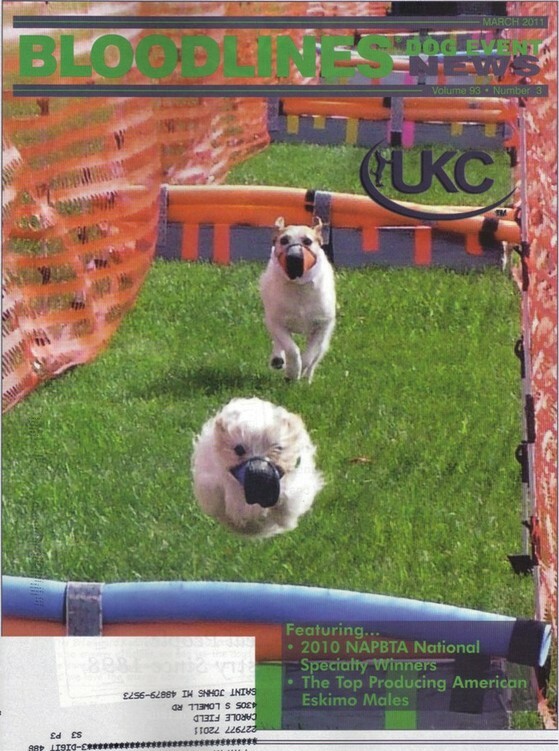 "Flying snowball" Kia as featured on the front cover of Bloodlines Dog Event News. Kia ran undefeated during the four years (2005-2008) she earned her Flat and Steeplechase Racing and Championship Titles! Kia (UFCH USCH PA OBPD1 Cher Car Ultimate Kia CGC TDI) possessed amazing racing abilities and was the first Parson Russell Terrier to earn UKC racing Championships (and the ninth dog of any breed). Kia is pictured in this celebratory photo with CCDSA members owner/handlers Deb Russell and Carole Field, along with breeder Cheryl Carlson. 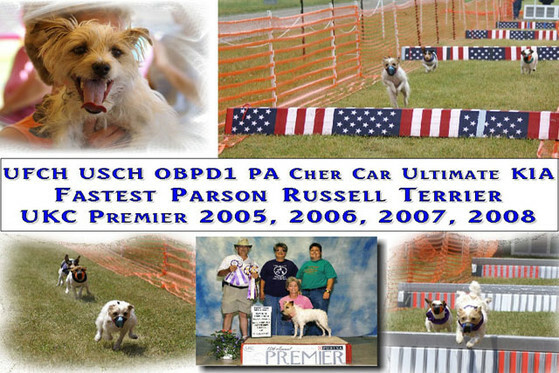 UFR USR UAGI GRCH Cher Car’s Divine Mustang (breeder/owner trained and handled by CCDSA founder Cheryl Carlson) was the fastest Parson Russell Terrier in both flat and steeplechase competition at the UKC Premier's inaugural Terrier Races in 2004.